Webb brings you a true ride-on mower with the flexibility of a rotary mower, the performance of a Briggs & Stratton 344cc PowerBuilt™ engine and a 76cm cutting deck, Making this mower ideal for the larger garden. The X350R lawn tractor is engineered to the highest quality standards, with a heavy-duty robotically welded frame, powerful fuel-efficient engine and high-precision cutting technology. It features a 107cm (42in) rear-discharge heavy duty mower deck, designed to allow a clean flow of grass cuttings for excellent cut quality even in normally difficult long grass. Simple to operate, with a modern car-style instrument display and a dial to adjust the height of cut from 25 to 102mm (1 to 4in), this machine is suitable for areas of grass up to 8000m² (about 2 acres). Its powerful 12.2kW/3100rpm Kawasaki petrol engine gets the job done quickly but without sacrificing fuel economy. The high capacity 300-litre grass collector means faster work with fewer stops to empty the clippings. A deluxe seat and cruise control also ensure a comfortable ride for the operator. The Smart Choice. Cut your mowing time in half with the zero-turn mower that is as rugged and tough as it is agile and smooth. The TimeCutter Z offers 25 years of expert zero-turn mower design and development, placing the professional brand in your capable hands - allowing you to groom your lawn like the pros. 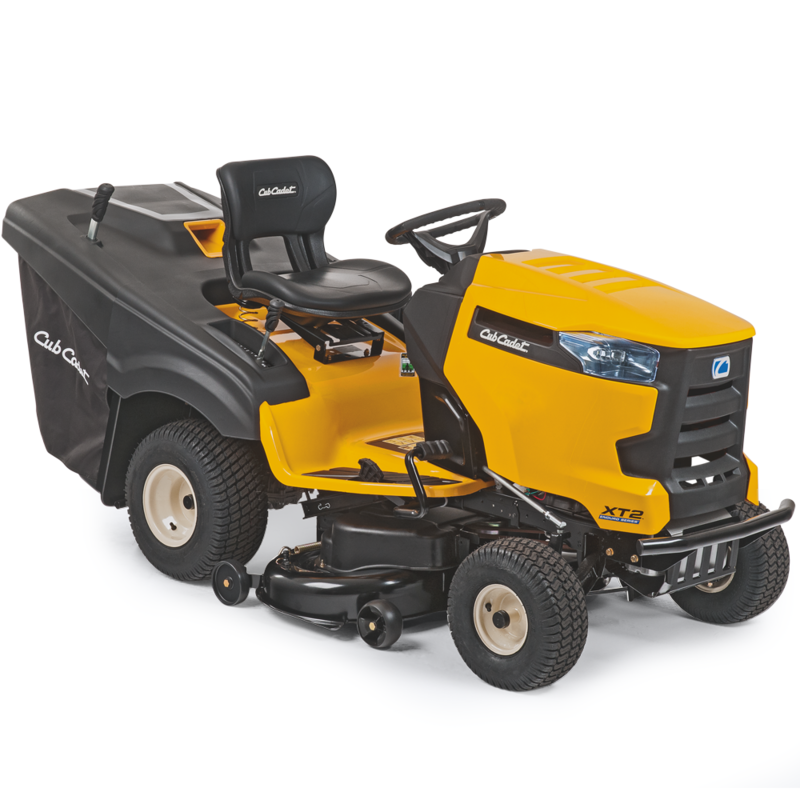 The XT2 QR106 features the Cub Cadet Tight Turn xTreme, where a turning radius of 17cm provides manoeuvrability in tight places and around the garden. The powerful V-Twin Kawasaki engine features a push button start and the hydrostatic drive system operated by foot pedal control provides a smooth and comfortable ride. It also features a 106cm / 42” cutting deck. The integrated bag full system identifies when the large 320 litre grass bag is full and the blade shut off system lets you know. The grass bag has a built in telescopic lever meaning that emptying it when full can be done without even getting out of the seat, whilst the RevTek system enables mowing in reverse. You can get updates about status & inspection dates on your smartphone through the Cub Connect Bluetooth® App and charge your phone with the multifunction socket.